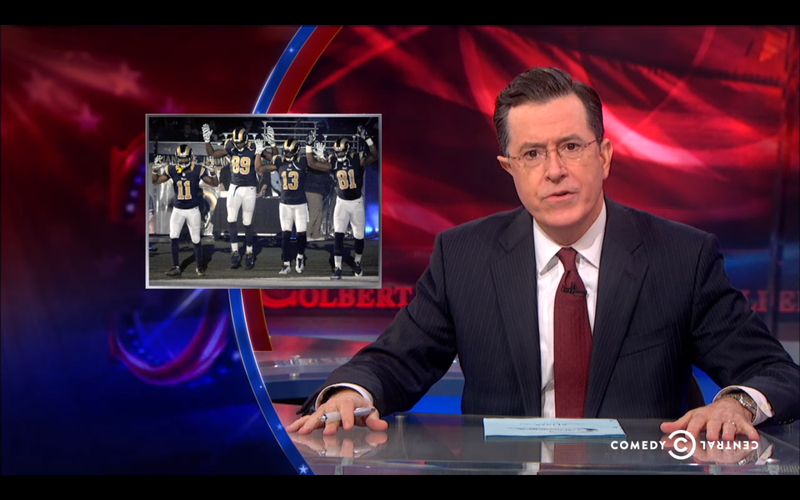 Stephen Colbert waded into the mess surrounding the St. Louis Rams players who came out to player introductions against the Raiders on Sunday in the "hands up, don't shoot" pose, and the subsequent demand from the St. Louis Police Officer's Association that the Rams apologize. The bit is quite funny (despite the audience's tepid reaction), and in addition to pointing out how absurd the St. Louis cops are, Colbert gets in digs at the NFL, the Raiders, Ray Rice, and the Gateway Arch. You can watch the video below. Rams Players Enter Field With "Hands Up, Don&apos;t Shoot"